Robert is a self-taught metalsmith. He tries to design his pieces to stand out from everything else out there. He feels he was drawn to fabricating jewelry due to its difficult and physical nature; forcing the metals and stones to transform into what he envisions them to become. He began slowly teaching himself to smith; accumulating his collection of tools and knowledge of the art anywhere he could but feels the greatest aspect of his learning came from within, as he endlessly experimented with the materials at hand. His raw and organic designs are fabricated with skill yet are free to grow without constraints or preconceived notions. His pieces are completely one-of-a-kind and made with his own hands, from sometimes rolling his own sheet silver from ingots he pours himself to grinding and polishing all of his own stones. Most of his pieces are designed with lots of texture and layering; giving his pieces a very distinctive and distressed look. In this ring workshop students will learn a variation of bezel setting a 20mm round cabochon using tabs. Traditionally cabochons are set with 28-30 gauge bezel wire pushed around the stone. 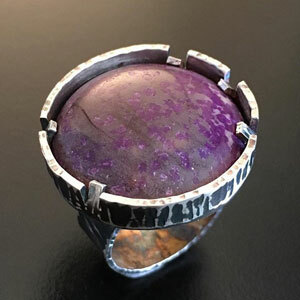 I have found in my work I like to use a heavier gauge bezel cut from 18-20 gauge sheet that I texture to give the piece more body; however, with thicker gauge sheet it requires more strength to push that bezel to the stone to lock it in place. We will cut small tabs in the bezel that are much easier to push, locking in the stone. I will also cover basic silversmithing techniques, soldering, texturing, forming, polishing and patina. The shank of the ring will be an adjustable shank made from 18 gauge sheet. All tools will be supplied for use during class, but students are encouraged to bring their own basic silversmithing tools if they prefer. Instructor will supply a selection of stones and glass cabochons to choose from, which is included in the kit fee. Stone will not be the stone in photograph. Students may also choose to bring their own 20mm cabochon .This is a beginner workshop, but keep in mind this project does require manual dexterity, good hand-eye coordination and eye sight. We will be using torches so I must insist that hair be pulled back, no loose or highly flammable clothing and closed toe shoes are to be worn.